Twitter's role in revolutionary Egypt - isolation or connection? 25 January – Thousands of Egyptians take to the streets nationwide protesting against the Hosni Mubarak regime, chanting "Bread and Freedom" and "The People Want to Bring Down the Regime." The protests were dispersed violently at the end of the night and many were detained. 27 January – Egyptians plan for nationwide protests on 28 January. In events of the previous days, six were killed in clashes with riot police and an estimated 850 to 1,000 have been detained. Egyptian authorities shut down the Internet at end of the day making Internet history. 6 February – For the first time, protesters hold a Coptic Mass in Tahrir Square. 7 February – Activist Wael Ghonim, who disappeared on 27 January, is released after hard campaigning to find his whereabouts. On the same day he gives a moving interview on Dream 2 TV, prompting masses to join the next day’s million-man protest. 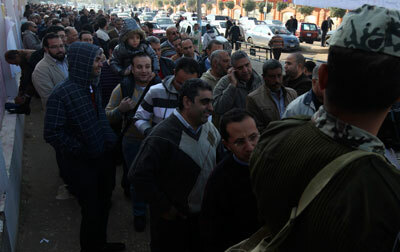 10 February – Crowds anticipate what is to be Mubarak’s final speech following news that the Supreme Council of the Armed Forces (SCAF) will remain in open session in order to safeguard "the people's achievements and demands". Mubarak's speech manages to enrage protesters who then march on the presidential palace, determined to bring millions to the street the next day. 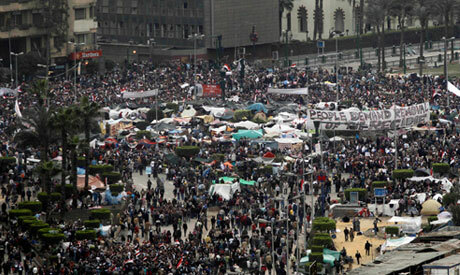 11 February – Millions of Egyptians take to the streets to protest in what is dubbed "Defiance Friday". Protesters in thousands march to the state television building and to the presidential palace and at 6pm Omar Sulieman announces on state TV that Mubarak has stepped down. 21 February – A wall outside Anba Beshoy Monastery is demolished by the army amid reports of the use of live ammunition. 25 February – A couple of hundred protesters are attacked by the military with sticks, severely injuring some of them. 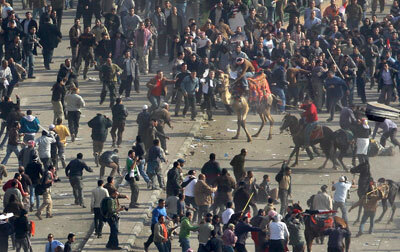 The attack was against a planned sit-in to protest against Prime Minster Ahmed Shafiq, who was appointed by Mubarak. The military apologises the next day, claiming the attacks were unintentional. 2 March – PM Ahmed Shafiq confronted by writer Alaa Al Aswany on ONTV, afterwards handing in his resignation. 3 March – Former Transportation Minister Essam Sharaf replaces Ahmed Shafiq as prime minister. Sharaf served under Mubarak from 2004-2006. 5 March – Protesters hone in on the infamous State Security Investigations headquarters in Nasr City, eventually getting inside the building. Nasr City State Security was one of the worst with regards to torture of civilians, according to protesters. On the same day, the governorate of Helwan witnesses sectarian clashes that resulted in the burning down and demolition of the church in Atfih. 8 March – Clashes break out in Mansiet Nasser, Moqattam, as Copts protest the burning of the church in Atfih, resulting in several deaths and numerous injuries. Some witnesses blame the army for the deaths with more allegations surfacing of the use of live ammunition. 9 March – The Tahrir sit-in that had extended from February is dispersed violently by army personnel and men in plainclothes. The dispersal is the most violent action since SCAF took over. Numerous activists are beaten and tortured in the Egyptian Museum, while the army performs virginity checks on 19 women protesters. 14 March – A Coptic sit-in outside Maspero (the state television building) protesting the demolition of the church in Atfih ends voluntarily by some members upon the army’s promise to rebuild the church. Those that remain are dispersed violently. 17 March – The first press conference implicating the army in torture and virginity checks is held at the Journalists' Syndicate. Numerous released activists and protesters speak about their experiences. 28 March – Activist and blogger Maikel Nabil is the first prisoner of conscience arrested under SCAF rule. Nabil had a longstanding position against compulsory service in the military. 30 March – After 11 days of waiting for supposedly simple amendments of the constitution, based on the results of the 19 March referendum, a constitutional declaration is announced by SCAF. 8 April – Mass protests take place in Tahrir demanding the full dismantling of the old regime, regarding it as bent on counter-revolution. Some army officers join the protests in uniform. The military violently disperses the protests with help from the police and arrests the army officers. 10 April – Activist and blogger Maikel Nabil is sentenced to three years in prison for his blog post "The army and the people were never one hand". 14 May – Coptic demonstrators are attacked while holding a sit-in outside Maspero protesting deadly Christian-Muslim clashes that left one church burned and 15 people dead. 27 May – Protesters take to streets and squares around Egypt in what is known as the "Second Day of Rage," demanding that the revolution run its course. 30 May – Activist Hossam El-Hamalawy and ONTV presenter Reem Maged are summoned by the military prosecution for criticising Egypt's ruling military on air. 18 June – Al-Fajr journalist Rasha Azab and editor-in-chief Adel Hamouda are summoned by the military prosecution for criticising Egypt's ruling military and are questioned the next day. 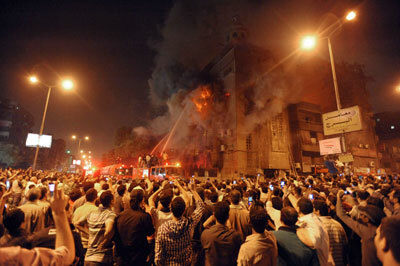 28 June – A premeditated attack on martyrs’ families at the Balloon Theatre in Agouza triggers protests in Tahrir Square. 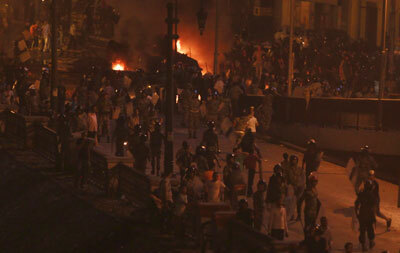 Clashes between protesters and the police continue through the night turning into mass protests the next day. 23 July – Thousands of protesters march from Tahrir Square to the Ministry of Defence to decry the unmet demands of the 8 July sit-in. Attacks on the protesters result in the death of activist Mohamed Mohsen. 1 August – Police violently disperse with sticks a sit-in in Tahrir Square on the first day of the Muslim holy month of Ramadan, leaving several people injured. 3 August – The trial of Mubarak begins. The former president, wheeled into a courtroom cage on a bed, pleads not guilty to charges of killing protesters and abuse of power. 9 September – Angry following the killing of several Egyptian army officers and security personnel on the Egyptian-Israeli border, protesters storm the Israeli embassy building in Giza, sending hundreds of documents out of the window of the building and into the streets below. 5 October – Military police violently disperse hundreds of angry Coptic demonstrators who were attempting to stage a sit-in outside the state TV premises (Maspero) in protest against the attack on the Mar Girgis Church. 18 November – Hundreds of thousands protest in Tahrir Square and in other cities, demanding that the army swiftly hand over power. 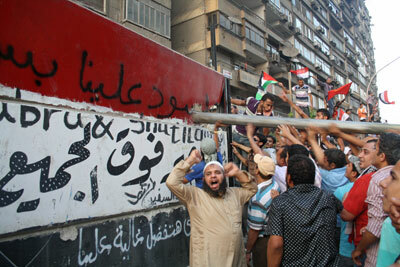 Islamists, protesting against controversial "supra-constitutional principles", dominate the demonstrations. 19 November – Hundreds are injured as the army bombards a small group of protesters with tear gas. Violence escalates in the next few days in Mohamed Mahmoud Street, one of the streets leading to Tahrir Square, leaving more than 40 dead. 21 November – The cabinet, led by under-fire Prime Minister Essam Sharaf, submits its resignation in the wake of the Mohamed Mahmoud Street clashes. 25 November – Tens of thousands flock to Tahrir Square in the “Friday of Martyrs,” voicing the same demand that Egypt’s ruling SCAF step down. 25 November – Kamal El-Ganzouri, who served as prime minister under Mubarak from 1996 to 1999, is named as the new interim premier following the departure of Sharaf. 28 November – The first stage of Egypt’s three-phase People Assembly (lower house) elections begins. 16 December – An army crackdown on protesters who were staging a sit-in in front of the Cabinet headquarters near Qasr El-Aini Street, Downtown Cairo, sparks fresh violence that leaves 17 dead.